One web UI trend that has been growing in popularity recently is to display content on long scrolling pages (as opposed to using tabs or paginating content). I love going through UIs that scroll, Rdio comes to mind as a good example. 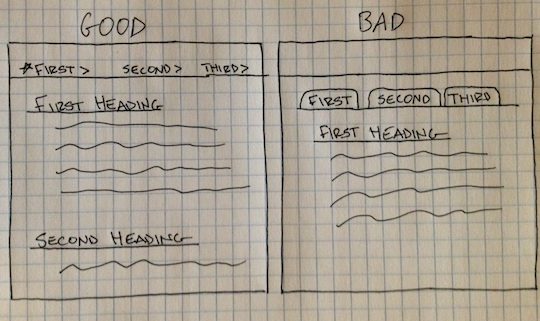 I’ve also seen a lot of newer landing pages that are laid out with vertical scrolling. With content layed out vertically and depending on heights, you will probably be able to tease the next section and keep the user engaged. I find it much easier to scroll(especially since I’m almost always on a laptop with multi touch scrolling or a mouse with a scroll wheel). Making the page easier to navigate should get users to expose more content. I’ve built a few sites with this layout. I have a general rule to not rewrite the same functionality three times - abstract it out and DRY it up. I wrote a jQuery plugin to use for future projects like this. It’s really simple to use, lightweight, configurable and is open source!